Food Sovereignty Ghana calls on Parliament to completely withdraw the UPOV-compliant Plant Breeders’ Bill and replace it with a “sui generis” plant variety protection (PVP) system suitable to our conditions. 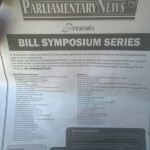 This call has become necessary in the light of the announcement by Parliament to provide “organisations and the general public the unique opportunity to have their say in the passage of any law through the BILL SYMPOSIUM SERIES” . First of all, we would like to reiterate our call for the publication of a report on the consultations so far undertaken by Parliament since the Plant Breeders’ Bill appeared before Parliament in June, 2013. We note that it is almost three years now since these consultations begun. We are also aware that a lot of petitions have been presented to Parliament. It does no one any good to ignore all these and organize a one-day symposium to replace such valuable and detailed work already presented to Parliament over the years. These consultations have supposedly been going on since 11th November 2014. We therefore believe that these series must not be used as an excuse for not accounting for the time and energy of Ghanaians who have already petitioned Parliament. There is absolutely nothing new to say that has not been said before. We are finding it difficult to shake off the thought that this is a way of avoiding the publication of the report on the consultations so far done by Parliament. Hon. George Loh confesses in the same interview mentioned above that, “The Plant Breeders’ Bill, I always say is the most misunderstood bill in our Parliament”. What prevents Parliament from publishing the report and clearing the air? Is the organisation of this symposium not also going to end up with a similar claim that “If after consultations, you do stand where you are, fine”? If not, we would like to know why Parliament still “stands at where they are” despite it being pointed out on several occasions that the Plant Breeders’ Bill (2013) is illegitimate and must be withdrawn? We strongly believe that it is about time that our Parliament shifts the discussion on the bogus UPOV-compliant Plant Breeders’ Bill to a focus on a “sui generis” PVP system for Ghana. This provision allows Ghana maximum flexibility in the design of plant variety protection (PVP). This is what many developing countries such as Thailand, Malaysia, India have done. The African Union Ministers have also recommended a unique Model Law for Plant Variety Protection. Ghana can protect plant breeder rights without necessarily opting for UPOV 91. The Bill is modelled on the International Convention for the Protection of New Varieties of Plants of 1991 (UPOV 1991) which is a rigid and an inflexible regime for plant variety protection (PVP). It is worth noting that today out of the 71 UPOV members, only a fraction – about 22 developing countries are members of UPOV. Most of these developing countries (e.g. Brazil, China, Argentina, South Africa) and even some developed countries (e.g. Norway) are not members of UPOV 1991 but rather UPOV 1978, which is a far more flexible regime. None of the demands by Ghana’s civil society and faith-based organisations have been included. For there to be a meaningful symposium, it would be professional to publish first the report on all the consultations, together with the proposed changes as a result of these consultations, so the symposium could serve as our final comments on this report. Otherwise, this symposium appears to be yet another convenient excuse to avoid accounting for the consultations so far and hiding under a symposium to pursue the same agenda. Our first demand is that as a member of the International Treaty on Plant Genetic Resources (ITPGRFA) we expect Ghana to take steps to realise farmers’ rights to use, sell, save and exchange farm-saved seeds, to protect their traditional knowledge and to allow their participation in national decision-making. Instead of rather than a Bill that is heavily tilted in favour of commercial breeders and which undermines farmers’ rights. “Joining UPOV under UPOV 91 narrows the possibilities for states to adapt PVP law to individual country’s needs and to involve stakeholders effectively”. Secondly, the Bill also contains a “presumption” whereby a plant breeder is considered to be entitled to intellectual property protection in the absence of proof to the contrary. Usually the onus is on the applicant to prove that he or she has complied with the necessary requirements and is thus entitled to protection. But in this case there is a presumption in favour of the plant breeder. This “presumption” provision and the lack of an explicit provision that calls for the disclosure of origin of the genetic material used in the development of the variety including information of any contribution made by any Ghanaian farmer or community in the development of the variety creates opportunities for breeders to misappropriate Ghana’s genetic resources using the PVP system and to exploit smallholder farmers. Ghana’s farmers must not be criminalized by Ghana’s laws for practising traditional farming. It calls for the harmonising of the goals and obligations from different treaties while implementing PVP law. We call on all those who have petitioned either for or against, to join us in demanding the publication of a report on the consultations done so far, and the conclusions of Parliament. A public account of these consultations would not only satisfy the order of the speaker who indicated, “This is because it is important to inform the people of Ghana”. but render transparent all controversies surrounding the Bill. We welcome the initiative to organize a seminar on a “sui generis” plant variety protection system. We think our attention should more be focused on that and do our best to draw the attention of our Parliamentarians on the need for a “sui generis” PVP system rather than another symposium on the same Plant Breeders’ Bill. There is nothing new to say on this that we have not said before! We also wish to take this opportunity to salute the farmers of Ghana, and the Peasant Farmers’ Association (PFAG) in particular, on the occasion International day of Peasant Struggle which is being celebrated by PFAG on 27th April 2016. Happy International day of Peasant Struggle!